Welcome to 87th edition of our Blogging Marathon. A 4 week non-stop blogging (except sundays) with interesting themes every week. For week 1, i have chosen Breakfast Dishes as my genre. As a south-indian, primary breakfast for us is Idly-dosa, we can eat idly/dosa for dinner too. There are so many idly and dosa varieties, you will never get bored of it. For day 1, i chose to make Aval/poha idly for breakfast. An instant idly that gets ready in 30 minutes. The mix can be made ahead and stored in an air-tight container, to be used anytime. The recipe is inspired from Jeyashri Kitchen. The original recipe uses only poha, the first time i tried i made a mistake in the liquid ratio, it didn't come out well. So, the next time i tried by adding a tbsp of sooji to the poha and was careful with the liquid ratio, the result was a soft and fluffy idly. Poha/aval/Rice flakes usually absorbs more liquid, so this actually tricks us to think that it might need more water, so be watchful there. A simple recipe, that is so handy when you run out of your usual idly/dosa batter. Dry roast 1 cup thin poha until they turn crisp. Let it cool completely. Grind them to a coarse powder in a mixie. Measure the ground poha, take 1/2 cup in a bowl, add 1 tbsp of sooji to it and mix well. Store the remaining coarse poha in an airtight container. In a saucepan, heat oil, splutter musard seeds, add hing, slit green chili, chana dal and roast until the dal turns golden brown. Add grated carrots and cashewnuts to this and saute for a minute or two. Now dump the poha and sooji mix in to this and take it off the stove. Mix well and let this mixture cool down. Once it cools down, add buttermilk and salt to this and mix well. The poha mix will absorb all the added liquid, it will look little tight. Do not add more liquid. Just before steaming, add baking soda to this and give it a brisk stir. Heat a idly steamer and fill the idly moulds with the batter and steam for 10 minutes. I used shallow bowls for steaming the idly, grease the bowl with oil, place 1/4 cup of poha mix into the bowl, smoothen the top with back of the spoon, dipped in water. Steam for 10 minutes. If steaming in idly plates, i suggest to steam the whole batch at the same time. Since the batter would become more dry as it waits. If it becomes too dry, add just a tbsp of water to the mix, stir well and steam. You can also wet your hands, roll the mix with your hands and place them into the idly moulds or bowls and steam. This will add rquired moisture to the poha mix. Serve the poha idly hot with a spicy chutey or podi, i served with mint chutney. That is pretty innovative, Priya. Great choice to start the marathon. Shall try this soon. wow thats an delicious take on instant idli , looks so delicious and soft :) Perfect healthy way to start a day . I would love to have this kind of no fuss instant breakfast everyday.. Wonderful recipe priya and am looking forward to all your healthy breakfast recipes this week.. 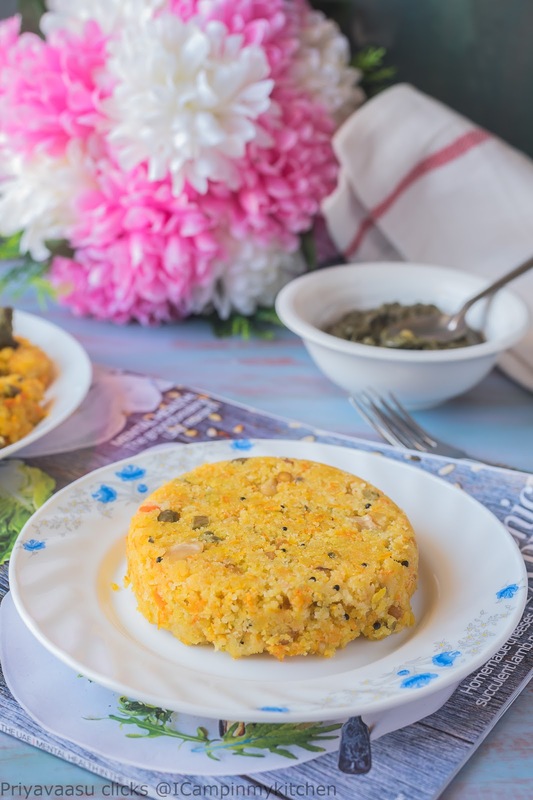 This instant poha idli sounds easy enough to make and looks soft and fluffy. Will definitely try it out some time soon. It never occurred to me to use poha rava in idli. This is quite innovate dish and am bookmarking it to prepare it in my kitchen soon. Looking forward to your dishes in this marathon. I can have idlis for all my meals. This version of idli with poha looks so colourful and yum. Must be a filling meal..
Love this version of aval idli.. Beautiful and perfectly yummy..The color again is so tempting..
Love instant idli recipes.They come in handy when we don;t have idli batter at hand and these recipes are like a boon! This idli looks nice and colorful and I will be trying this out, after the mega BM. 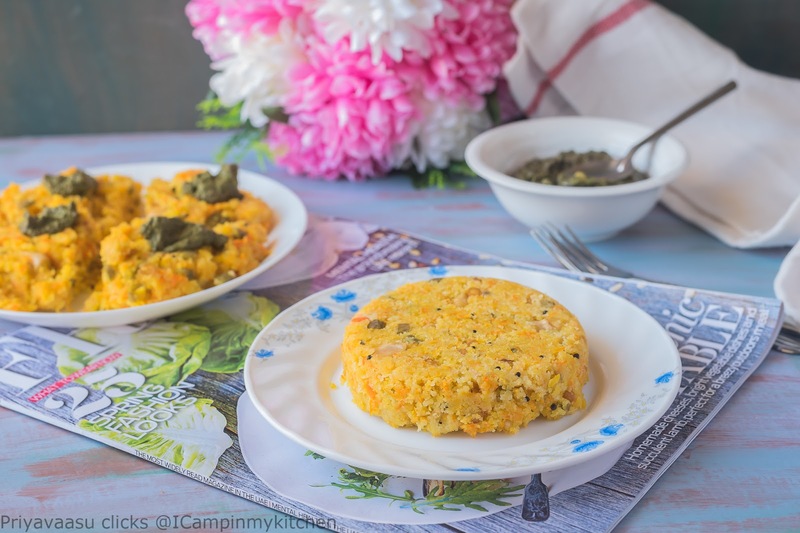 Good one Priya..
That's one wonderful dish to start the series Priya, the idli with poha sounds like a good twist as well..Can't wait to read your creation for each day! Aval idli looks so soft and delicious. 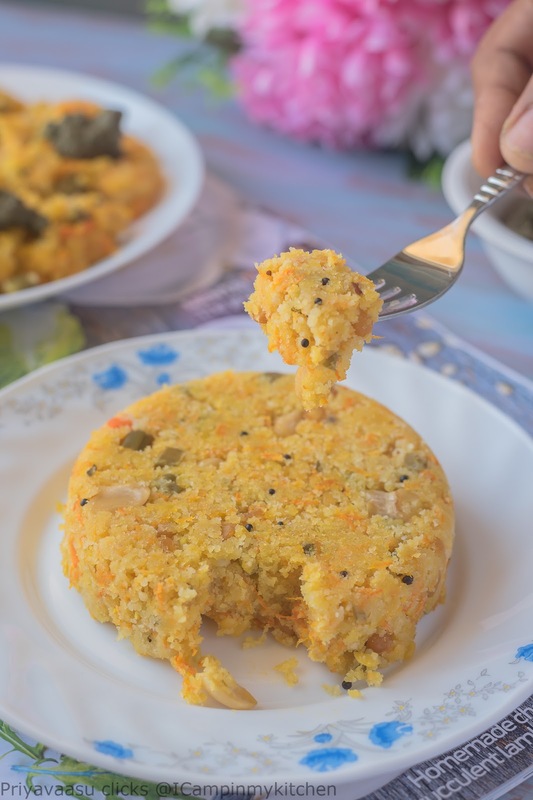 Such a wonderful idea to use aval rava to make idli. I too choose breakfast dishes but some other week.Looking forward to seeing more interesting recipes from your space. Wow this aval idly will definitely please anyone's at home. Especially this idlies can be prepared with less efforts, am loving it. Lovely theme Priya, Waiting eagerly to see your next post. wow ! love idli, love break fast, love poha ! and anything instant and life saving is worth a bookmark ! great start, priya.. Same pinch Priya! I am also doing the exact same thing but in a to Z order. I am scattering the themes though. 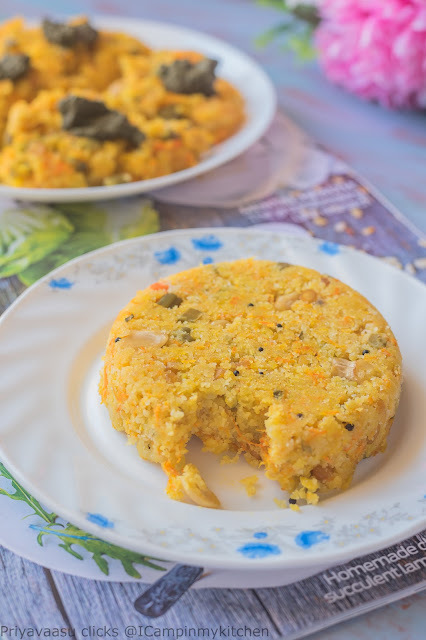 The aval idli is so different and definitely a keeper recipe for busy mornings. Can't wait to see the rest of your posts. Love this kind of instant idlis !!! Such a innovative and quick recipe. Seriously i'm bored of my regular poha upma, will give it a try soon !!! Great start to Mega BM, looking forward to your A-z series !!! A new recipe and love the fact that it is instant. Obviously bookmarked. Love the addition of veggies and steaming it containers is a great idea. Awesome start Priya. Very innovative and perfect option for breakfast... lovely start. That's one innovative idli. Looks really delicious and adding veggies is a plus point.